You're a beginner frontend developer or designer who wants to start working with server-side projects. 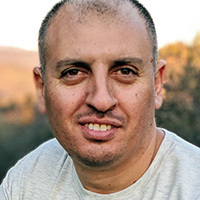 Samer Buna has over 20 years of experience in software development, during which he has worked on web and mobile applications development, API design, functional programming, optimization, system administration, database management, and scalability. Samer is the author of several technical books and online courses on topics such as Node.js, React, and GraphQL. You can follow his latest work over at jsComplete.com and EdgeCoders.com.